This glittery confection was created to house some our valentine treats. They are favor boxes adorned with P K Glitter Glitz. The cricut and P K Glitz Sticky Paper provide the means to an easy assembly and impressive display. Want to see how it is made? Check out the video tutorial on my YouTube channel. 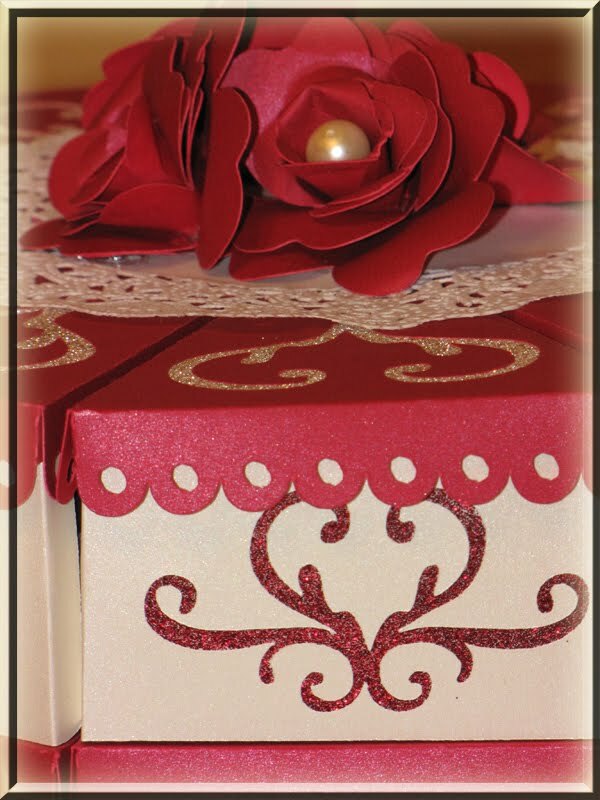 The Cricut Design Studio allowed these heart shaped windows to be cut inside the cake favor box pattern and the lids as well. P K Glitter Glitz in Crimson and Golden Cadillac provide the sparkle and glitz. It was enough to make your mouth water and with these tempting chocolate cake favor boxes as the means to pass out our favorite chocolate treats, it was a fitting combination. 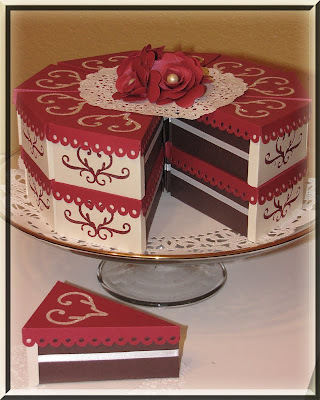 EDIT: This post was highlighted on Party Time Tuesdays Your Daily Dose blog on February 6th, 2014. Leave a comment below and have a fantastic Valentines Day! Congrats on making the Cricut Chirp Newsletter with this fabulous idea! WOW!!!! Your cake is beautiful! I watched your tutorial on YouTube, which has given me the courage to try making it. How big did you make the different layers? I liked how you cut the top layer smaller so you can see the cut out glitter pattern. Thanks for sharing your talents and your hard work. I am a follower now!